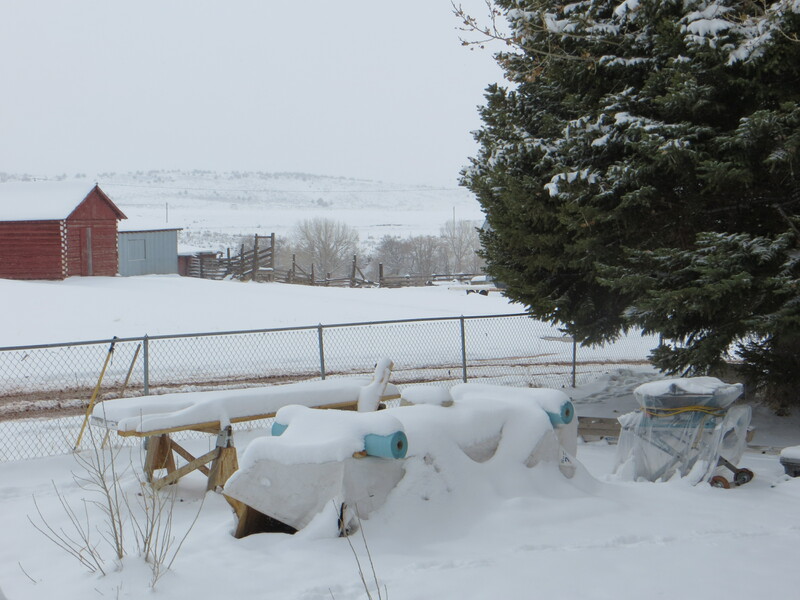 Which is better than many parts of Wyoming that did receive the predicted foot of snow. The 60 and 70 mph winds did hit the southern section of the state, and the usual windy spots had their snow blown into impressive drifts as well. Good thing our carpenter listened to the weather reports and battened down his tools and supplies in my front yard! I’m sure I wasn’t the only ranchwife to have one of these in her house today, either! He was just a tad chilled… and his momma wasn’t anywhere to be found, so he came for a visit. 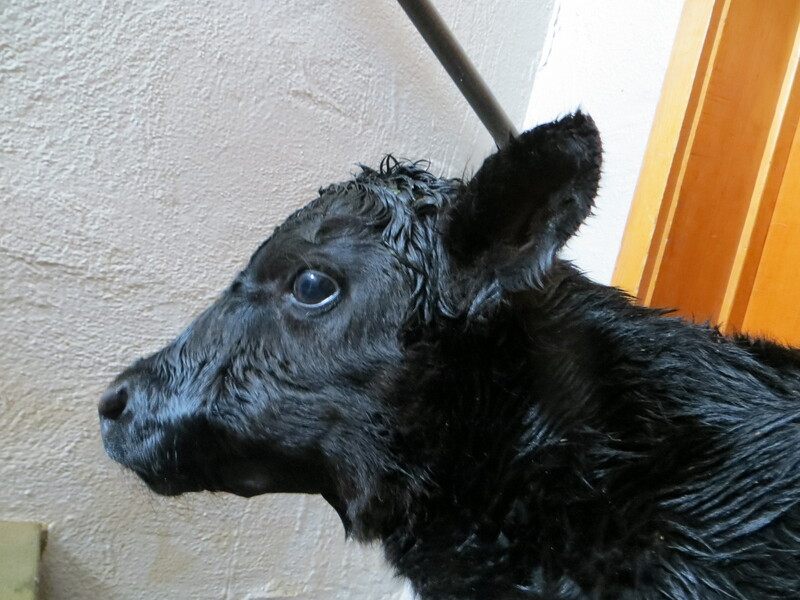 He had some colostrum and a rub down and a nap. I’m sure it was much warmer in my house than outside. 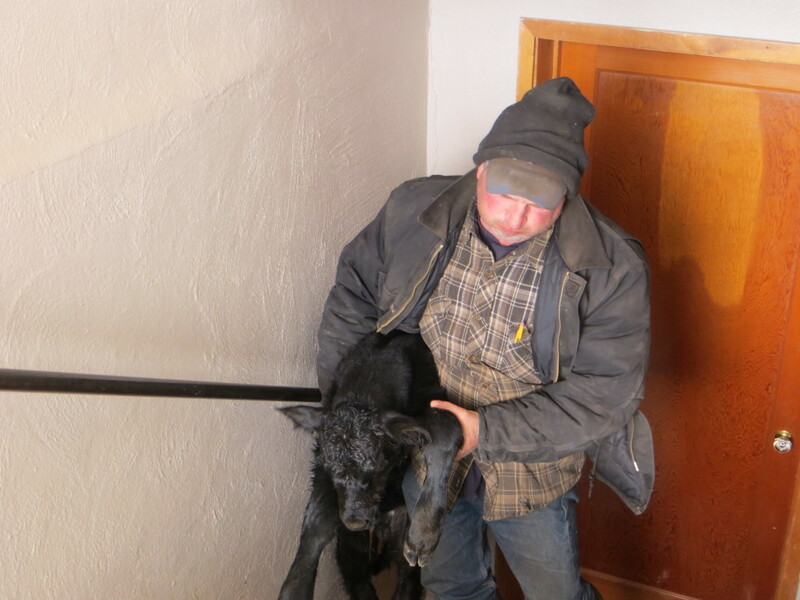 A few hours later, Vernon located his mom and returned the calf to her. It was a short visit, but that’s for the best. There’s nothing like momma’s milk and loving care! Last call for Questions… Answers on Thursday! Sorry I posted twice. I’m still learning how to use my smart phone. What titles are on your “gotta read that book” list? What books are in your library? What titles are in your library? What titles are on your “gotta read that one” list? OH, what a sweet pretty baby. Was its Momma calling for it? I am SO ready for SPRING. We don’t get the snow and ice in N. Texas like Wyoming, but today our temp at 5 pm is going to be 42. Our daily high was 78 this morning at 12 am, but that front has come in with big winds.